These Spring Rolls will oooh and ahhh your friends and family. 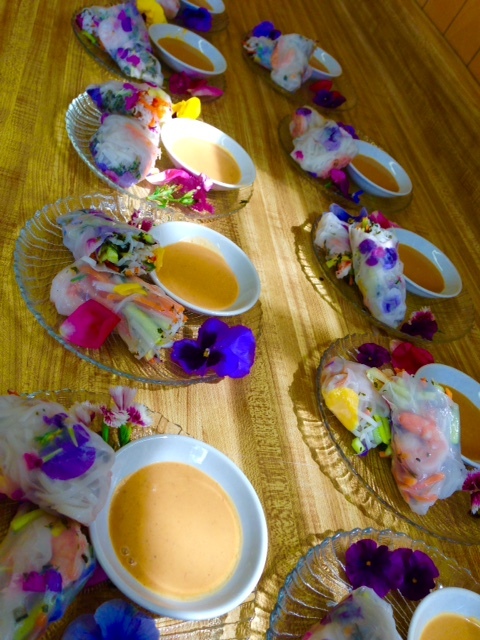 We love the light crispy flavor of Spring rolls, but you will be romanced and tantalized with these because of the addition of herbs and the edible flowers. Remember we also eat with our eyes, and when food tastes wonderful and looks beautiful it is even better. Prepare and assemble all ingredients. Bring 4 quarts of salted water to a boil and add the noodles. Boil for 4-5 minutes, then drain into a colander and rinse under cold running water; set aside. Fill a 9-inch pie pan with warm water. Working one at a time, put rice paper sheet in the water and remove as soon as it turns transparent. Arrange on cutting board so that there are no wrinkles. Place 2 shrimp halves, cut-side up on the paper. Scatter edible flower petals on the paper, leaving a 1-1/2-inch border on both sides. Put a portion of the noodles over the flower petals, then some of the carrots and cucumber, then scatter a portion of each herb over the top. Place 2 more shrimp halves, cut side down on the herbs. Beginning at the side furthest from you, fold the rice paper over the filling, scrunching it tightly, but taking care not to tear the rice paper. Fold both ends toward the center, then continue to roll towards you, forming a tight roll – the tighter, the better. Place rolls on parchment-lined sheet tray. Keep refrigerated until ready to serve. Serve with small bowls of desired dipping sauces. Combine the sesame oils, ground coriander, ginger, and cayenne pepper in a heavy-bottomed 2-quart saucepan over medium-low heat. Cook slowly until a good aroma emanates from the pan. Remove from heat and set aside. Place the peanut butter in work bowl of food processor fitted with steel blade. Process until very smooth. Add the heated oil and spice mixture; process until thoroughly blended, then add all remaining ingredients except hot water. With processor running, add the hot water I a slow stream through the feed tube until the desired texture and thickness is achieved and the sauce is very smooth. Turn the sauce out into the saucepan and simmer for 15-20 minutes to add a greater depth of flavor to the sauce. Serve at room temperature.